No more nail biting, desk drumming or pen clicking. The Fidget Spinner is here. Don’t stop at just spinning the gadget between your thumb and forefinger. Try some tricks with your new gadget. Infact why not have an office Fidget Spinner Contest. See if you can spin the gadget balanced on top of fingers, toes, or event the nose or forehead. More than one can be stacked on top of one another, creating a spinning tower that plays with your vision. As the forces come into play, the skill lies in trying to pull off various tricks and stunts. The biggest challenge is throwing a spinner to a friend and trying to catch it, a feat even more impressive to pull off than the successful bottle-flip. 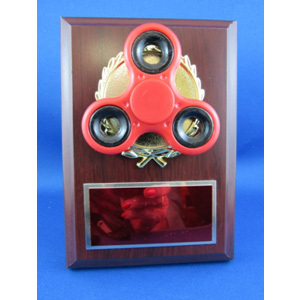 If you are looking for a cool award for your “TOP OFFICE SPINNER”, look no further we have them here at Hoult-Hellewell.